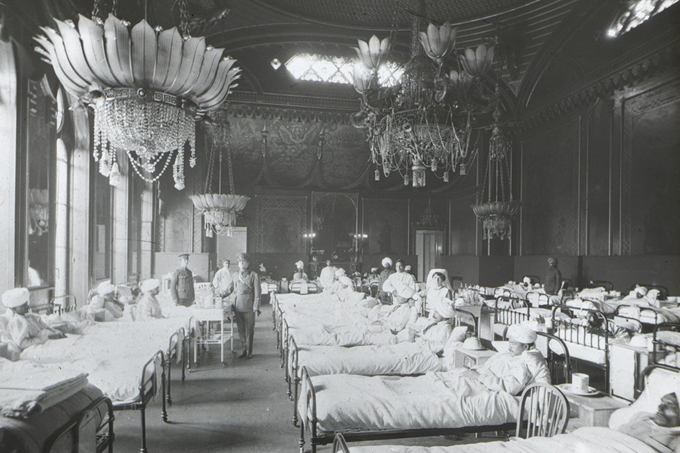 6 days is what it took to convert the Royal Pavilion Palace, the Dome and the Corn Exchange buildings into war hospitals where thousands of Indian soldiers were treated during the First World War. It was called “the greatest Indian hospital outside of India”, explains Louise Peskett, who has been a guide at the Royal Pavilion for over 10 years and who has brought together a tour to explain the bond between the Royal Pavilion and WWI. It is one of the thousand events organised in Brighton and across the country to commemorate the 100-year anniversary of the Great War. Converting a Royal Palace into a hospital was not a coincidence. The building was a symbol of luxury and the British wanted the Indian soldiers to feel they were in the best hands. “The Palace had great PR potential as India was a great recruiter for the First World War. There was a hope this would reinforce a sense of loyalty to the United Kingdom”, affirms Peskett. At the beginning of the war, the allied British and French forces were outnumbered by the advancing Germans, so reinforcement was brought in from British colonies. 1.3 million soldiers, from what is today India, Pakistan, Bangladesh and Nepal joined forces, making up 20% of the total soldiers on the frontline. For many of the recruits, it was their first time out of their towns. Most of them came from rural areas. “They sailed off from Mumbai thinking they were going to Egypt to be kept as reserves but the plan changed and the destination was Marseille, where they would join the allies on the Western Front where the battle had got worse”, explains Peskett. 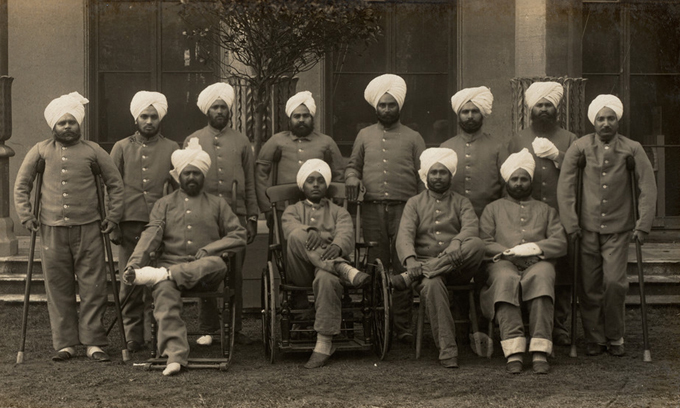 Over 4000 Indian soldiers were nursed in The Royal Pavilion buildings, being the first casualties to arrive in October 1914. There was scrupulous attention to detail; in particular, to accommodate religious and caste demands. Separate water supplies were provided for Hindus and Muslims, at least 9 different kitchens were built and notices throughout the hospital were printed in Urdu, Hindi and Gurmuki. Keeping up morale was also important. Trips to the Pier and the Aquarium were organised, silent movies were shown using the Dome’s magic lantern projector, and organ concerts were held every Sunday. However, the Indian soldiers complained about the lack of freedom, as they were not allowed out on their own. Peskett takes the visit group to the Pavilion garden to show them where a big fence around the garden was built. “Soldiers were unable to come and go as they pleased and the authorities were criticised by the soldiers and townspeople alike for keeping the injured chaperoned and separated from the everyday life of the town”, states Peskett. Mir Dast’s stories is one of the many you can find out about during the tour that Peskett has organised, with incredible detail to bring us closer to how the Indian soldiers lived and suffered during the First World War. Some argue these events are an opportunity to reassure us that the lessons learnt from the Great War will not be forgotten and will not happen again. Others state that history repeats itself, being an example of the current conflicts unfolding in the world. Singh’s letter is one of the 2 billion sent from and to the UK during the 1560 days of war that ended with 17 billion soldiers and civilians dead.